36. Being Tazim 72. Just Say I Told You So! Can't leave a comment other then a reply, so I would use ti for something fun for me... like a lunch with my girlfriends. I'd use it toward a crib for my new grandson. Save it towards school tuition! Safe it up for when my book buying ban is over (in July) I'll invest it in bookish goodness! I would probably spend it on books. I would use it towards groceries. I'd use for some picture books. I am hosting a Giveaway for beginning chapter book for ages 7-10. Thanks a lot for this great giveaway! I'm saving for birthday and Christmas presents. My son has a birthday coming next month, I would use it for his gift. I'd buy some new clothing or accessories. If and when I win your $40 paypal cash giveaway, I will spend it at the gas pump to fill up my gas tank! Thanks for the opportunity! My son's and my grandmother's birthdays are coming up, so I would probably use it toward that. I am moving soon and need a couch so would put it towards that. I would buy some good groceries for a fancy dinner in! It would go towards my birthday vacation! I will save for a new phone. Something fun. Maybe a book for my son. I'd probably do some browsing through eBay for a Kindle accessory or two. I would like to buy some new tennis shoes. I would put it towards bills. I would use it for items in our new home. I would buy my son a cool birthday present. I'd get a new ink cartridge. I would buy a baby shower gift for a friend! I would use it towards school books. I would pay a bill! I would use it to pay for bills or groceries! Any paypal i get is going to be saved for xmas. I'd put it towards by best friends upcoming babyshower. I would use it to buy groceries. I'd use it to buy some crafting items my mom needs! I'd love to get an ipod and put this towards getting one. I'd probably use it for groceries. I would blow it on ebay. Thanks! I would probably put it toward some new running shoes! thanks for all of the contests, love the way you have them set up to see.. I need K cups for the Keurig. I would buy some medicine I need, but can't afford. I would use to put towards our vacation when my husband comes home from Afghanistan fund! We are moving to a new house soon and there are a lot of new items that I need to purchase. I'd put it in my hubby's checking account! I would put it in the gas tank. I would buy gas for my car with it. I'd buy fresh fruits and veggies! I would go to my camera fund! Not finding a spot to actually comment so replying here. I would probably use the money to buy some of the supplies I need to start making some jewelry I have in mind. I would buy books and a gift for my kids. I will save it for a rainy day. I would use it for my nieces birthday present. I would use it towards bills most likely. Every little bit helps! I'd use it to help pay some bills! I'd probably buy ebooks for my next vacation or a new backpack. Groceries and a b-day cake! I would buy some upcoming birthday presents. Use it to help pay for bills or gas! I would buy a few cloth diaper! I'd buy books, yarn and some cosmetics. Not able to post my own comment, so using reply to post. I'd buy my daughters some new spring shirts. Buy my sister a birthday present! I would buy some things that I've been wanting on Etsy! I would put this towards an iPad3! I'd load up my Kindle with three or four new e-books with the cash. Thanks! I would use it toward the cables, remote and other stuff I need to get a TV working in my living room again. I would use it to buy new sunglasses. I would use it to buy a dehydrator. I am saving my money to get an excalabur dehydrator. This would put me a little closer. I'd buy a case of my favorite chocolate that I can't get out here in the boonies! My daughter's birthday is coming up ... definitely wouldn't have a problem spending this on her! I would buy a toaster. I would add it to my vacation fund. I am in need of an air purifier. I'd take my husband out for dinner. Present for my Granddaughter's birthday. I would put it towards appliances I will soon be buying for the house. I would save it for the baby we're having in May! I would get some summer clothes for my girls. thank you! I would put it towards a new computer. I would use it to start my Christmas shopping! I would put it towards new cabinets for my kitchen. I would buy groceries or Easter baskets. Buy a new Castlevania game from Ebay. Get some spring workout clothes! I would download more books to my kids' eReader before our cruise in a few weeks! I'd take my boyfriend out to dinner. I would save it for a new TV on Amazon. Put some gas in my vehicle. If lucky enough to win, I would use the money towards replacing my recently deceased printer! A new one just is NOT in my budget at the moment! I'd buy a bathtub for my new baby! I would use it towards my youngest son's birthday on March 25th. I'd add it to the "date night" fund. I would use it to buy an antenna and cancell cable. :-) Thank you. Put it towards a new window air conditioner. I would use it to buy gifts for a few upcoming birthdays. I would use it towards a new pair of shoes! I would definitely love to get something for my daughters graduation in June. i'd use it toward a new camera. I would spend it on books or put it towards an e-reader. I would splurge and take my kids to a movie and get some treats for them as well! I would use it to buy a craft magazine and some beads. Nice giveaway. Thanks. I'd probably use it for a bill or I might save it to use on the next family birthday that comes up. I would buy my best friend baby clothes for her baby shower.Thanks for the giveaway. I will buy birthday gifts for my daughters who both have birthdays in a few weeks. I would buy some food! I'd buy some books with it. Thanks for stopping by. I look forward in reading all of your great comments. Have a great day! ebooks - Your one stop digital shop for instant downloads of ebooks and softwares. 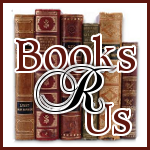 VIEW BOOKS R US ON YOUR SMARTPHONE.